Heat oven to 350°F. Spray 36 mini muffin cups with cooking spray. In medium bowl, beat cake mix, water, oil and egg whites with electric mixer on low speed until moistened; beat 2 minutes on high speed until well blended. Divide batter into 2 bowls. Tint 1 bowl of batter with a few drops red food color; tint other bowl with blue food color. Fill 18 muffin cups 2/3 full with red batter. Bake about 15 minutes or until toothpick inserted in center comes out clean. Remove from oven. Repeat with blue batter to make an additional 18 mini cupcakes. Cool completely. To assemble push-up cakes, drop 1 mini cupcake into each push-up pop container. Add generous teaspoon frosting to top of each cupcake. Top each with second mini cupcake; add dollops of frosting to tops of each. Sprinkle each of popping rock candy. Serve. 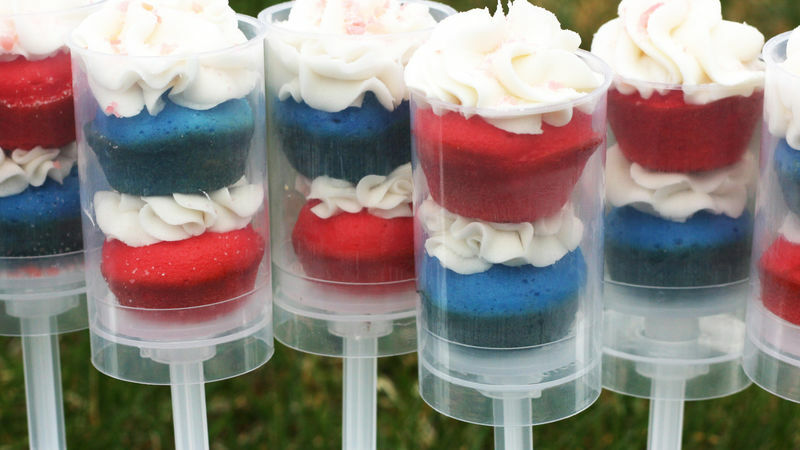 If popping rock candy isn’t your thing, go with festive sprinkles in red, white, and blue. If you have a hard time finding the containers, do an Internet search for “plastic push pop containers”—there are several restaurant supply companies that sell them.